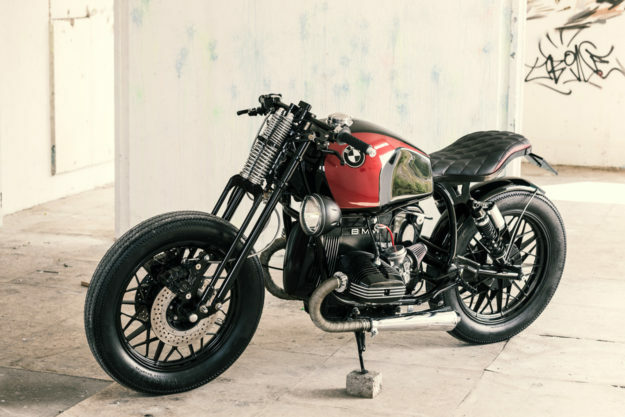 When we first clapped eyes on this unusually styled BMW, we assumed it came from a pro workshop. The finish is immaculate, the proportions are unconventional but perfectly judged, and the girder fork is a minor feat of engineering. 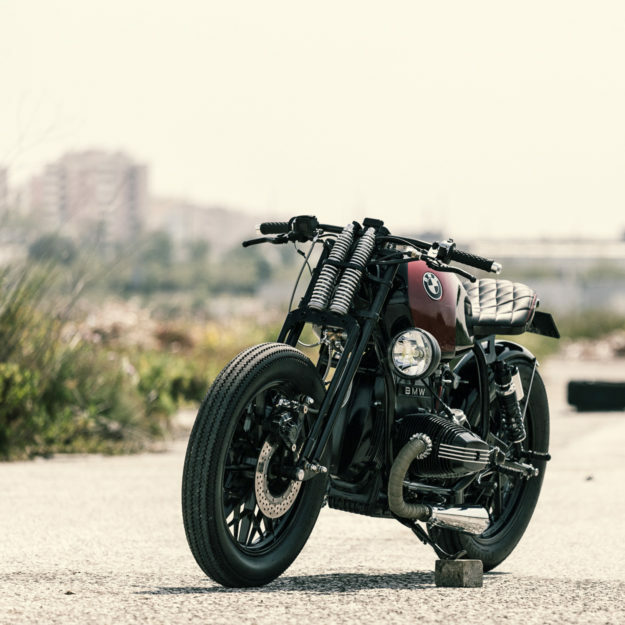 So we were surprised to discover that this bike comes from a pair of first-time builders: Tiago Gonçalves and Luis Gonçalves of Portugal, who are friends rather than brothers. 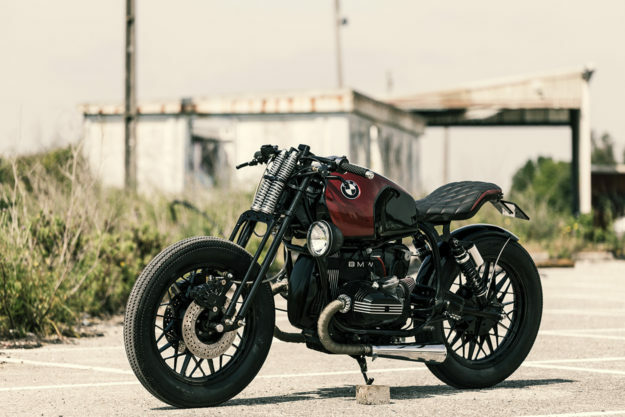 Like many builds, the story begins with a Sunday motorcycle ride. “We went to the westernmost point of the European mainland, Cabo da Roca,” the guys tell us. 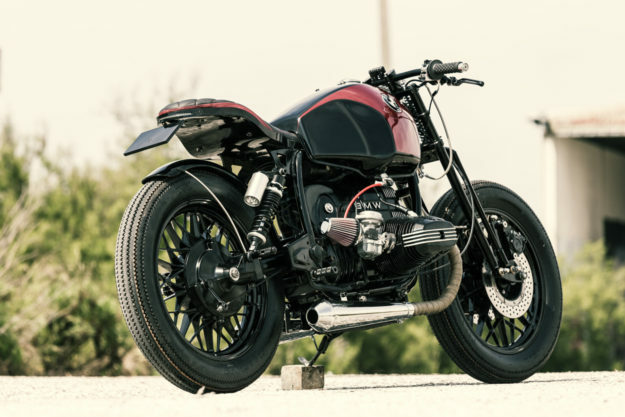 The goal was to create a custom motorcycle with seating for two, dark but elegant styling, and using a BMW airhead as a base. The Portuguese designer Rodolfo Tiago helped with renderings. The most arresting part of the bike is obviously the girder fork. But this isn’t an off-the-shelf item converted to fit a BMW: it’s been designed and built from scratch in Portugal. 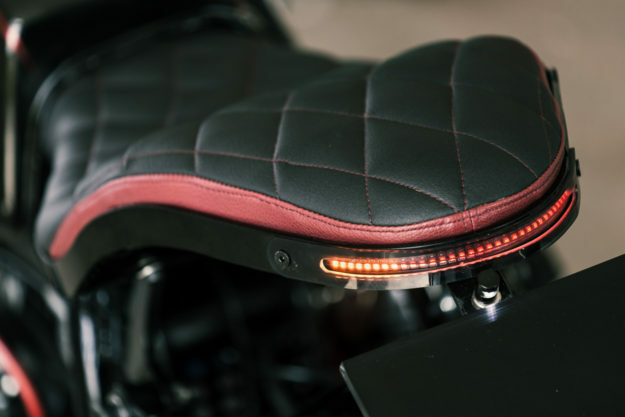 The rear frame is completely new, and hides a discreet but wide LED strip for turn signals and brake lighting. 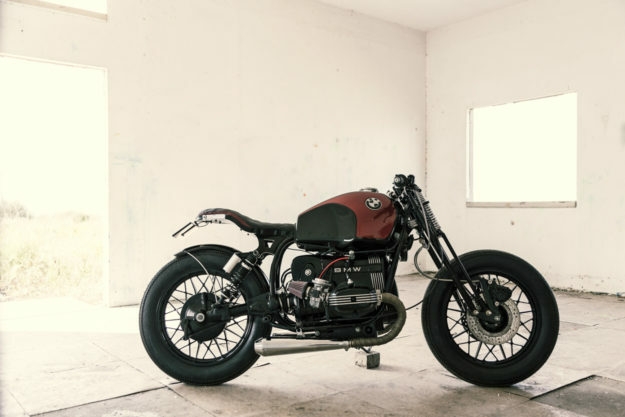 Eagle-eyed owners of classic BMWs will spot that the foot pegs have been moved back a little, too. 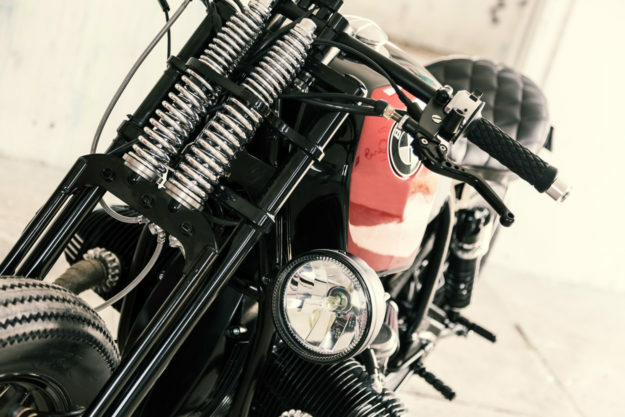 There are new mounting points for the modern gas shock absorbers: They’re now set at a more rakish angle, adding to the sporty vibe of the bike. The slab-sided R45 tank is gone, replaced by a more curvaceous R80 unit. The new seat is equally voluptuous, with a slim, stepped profile that adds visual drama. The quality of the quilted leatherwork is outstanding: there’s no fear of close-up inspection here. 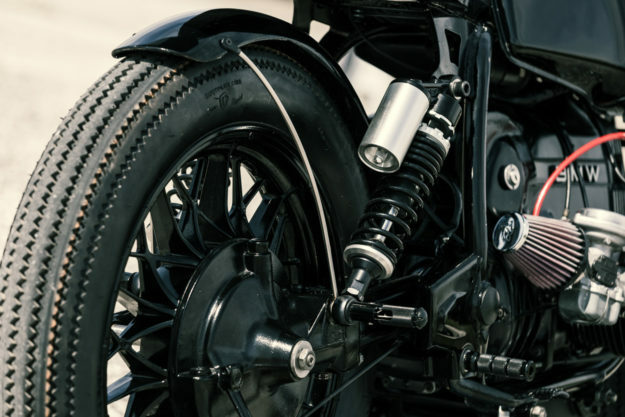 Protection comes from a snug-fitting fender, adapted from a Honda CB250 front fender. A neat curved stay holds it in place. The engine mods are more conventional, with the Bing carburetors now breathing through external K&N filter intakes. 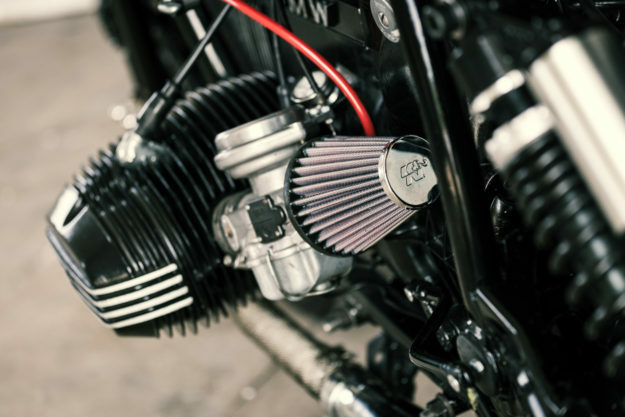 Inside the classic BMW engine ‘box,’ the ignition system sits in the place of the original air intake, and a compact li-ion battery takes the place of the stock filter. The finishing is top-notch with a distinct vintage flavor. There’s black powder coat for the frame, suspension and wheels; but on the tank is a high-gloss purple, with matching purple stitching on the seat. The blue is gone from the traditional BMW tank badges, replaced by deep black and a modern carbon-effect grey. 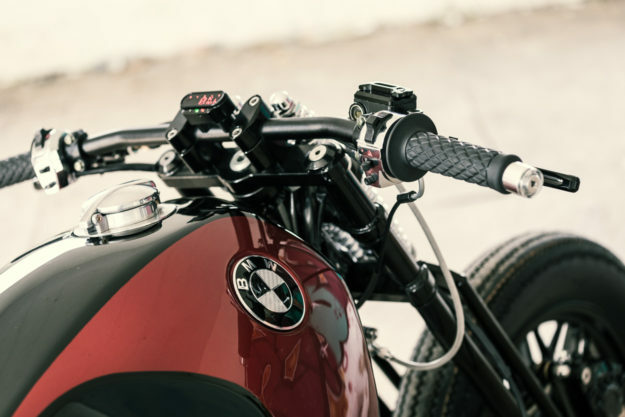 Another modern touch comes from the tiny Motogadget digital gauge and the front turn signals concealed in the bar ends. 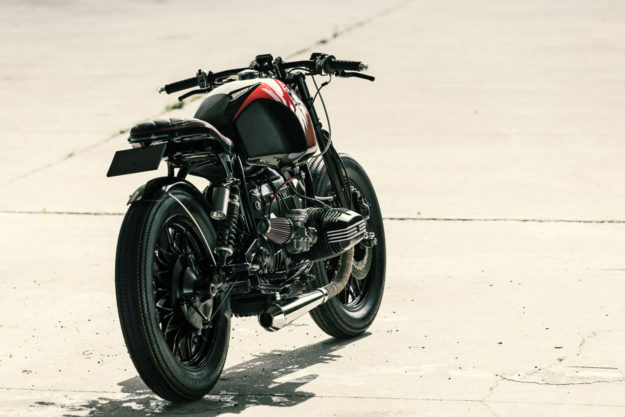 But what elevates this R45 above most other BMW builds is the stance and proportions—the traditionally staid aesthetics are gone, replaced by waspish curves and elegant engineering. Top marks to Tiago and Luis for a truly amazing first build, and for trying something different. We can’t wait to see what the guys come up with next.